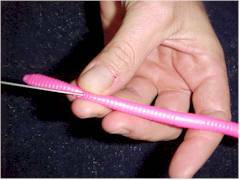 How to rig the Pink Worm!! Here it is! How to fish the dreaded pink worm. With the growing number of areas with bait ban restrictions, we've been looking at alternatives to drifting bait. Over the past few years, there has been a growing number of Washington and Oregon anglers experimenting with the worm on winter-run steelhead. 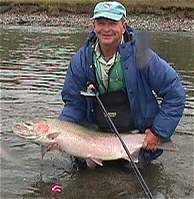 Originally developed as a steelheading technique on Vancouver Island, the pink worm (fished in a variety of ways) is perhaps THE most popular conventional tackle offering in Canadian waters ... for both summer and winter fish. We've had pretty darned good success with the worm fishing it in two ways: under a bobber, and backtrolled behind a diver. Some people also drift fish ('bottom-bounce' in Canada) the worms. 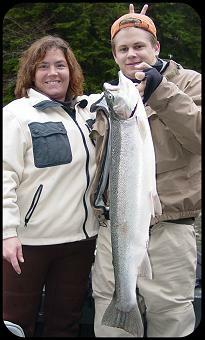 A pink worm fooled this Hoh River hatchery steelhead. We'll assume that you know how to rig up a diver (see the old diver tip for a quick overview) and / or a slip bobber set-up. 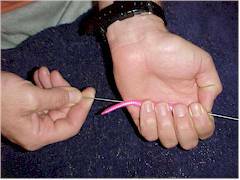 What we'll show you here is how to thread the worm and how we use it with both the diver and the bobber. 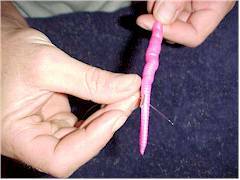 Threading the worm: easy, if you get a bait threader (needle) available at many of the local tackle stores. 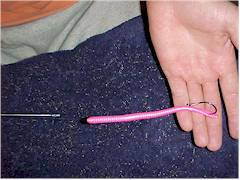 We find it easiest to wet the threader before proceeding, then starting about an 1 1/2 inches above the tail, slide the threader into the worm. Your next step is to thread the needle up the worm, this is best achieved by a combination of pushing the needle in and pulling down on the worm. Just make sure to do your best to thread straight through the body. If you exit the side, just slide the needle back a little and keep working it up the needle. Make sure to exit the worm at the very tip top. Then, continue to slide the worm down the needle (threader). 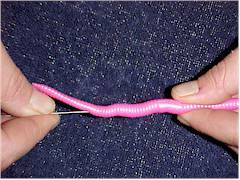 This is best achieved by grabbing the entire body of the worm with your fingers in order to keep it from bunching up too badly as you push the needle all the way through. Your next step is to take a leader (with a hook attached of course) and run just an inch or two through the hole (eye) of the needle. For hooks, we generally run 2/0's. We'll use about three feet of leader for use under a bobber and about five feet for use behind a bait diver. Then, just as you would pull a needle and thread through a piece of cloth, pull the threader and line through the worm. Again, you might find it best to grab as much of the worm as you can when you slide the leader through until you get to the hook. You'll find that you kind of have to stretch and move the worm in order for it to lay straight on the leader. It must lay straight on the leader rather than curled for it to impart fish-catching action (or so it seems to me, anyhow). As you are fishing it, sometimes you'll have to adjust the worm so that it lays in a straight line. As noted, we run about five feet of leader when we run this worm rig behind a diver. All you have to do is tie it onto a snap swivel attached to the belly eye of a hot 'n tot or other hard-diving plug. One note here: we use only a floating worm behind the diver ... a sinking one gets hung up a lot in the rocks, the floaters don't. We have found that a VERY slow drop of the boat works best. Under a bobber, rig just as you would a jig, but instead of the dropper from the swivel to the jig, replace it with the leader with the worm on it. It takes a fair amount of split shot to keep these near the bottom. Usually, we'll place three #3 split shot right at the swivel (three feet up from the worm) and two #3 split shot about a foot and a half up from the worm. Fishing the bobber and worm works best along current seams. Make sure to allow the rig to sit in some of that totally slack water too, you'll be amazed at how many fish you yank out of it! Good luck!!! We've made a worm freak out of Art!